The Cayman Islands are a golfer’s paradise; it is warm and sunny year-round, and there is not a single snowflake to be found. Connecticut, on the other hand, is a cold, bitter and snowy state. Golf courses are only open for seven or eight months a year, and they never get to experience the ‘ideal golf climate’ that Caymanians live with. Yet 19-year-old Cayman native and Emily Ribbins left the tropics to go to a Connecticut school to play golf. Ribbins enrolled at Quinnipiac University prior to the 2013-2014 season, despite knowing that the school was not ideal for her golf career. She said that she went over the pros and cons of playing golf in New England. There were ultimately more cons than pros, but Ribbins rolled the dice and took road less traveled. The sophomore golfer did play on American soil prior to her freshman year at Quinnipiac, and it was mostly down south in a warm climate. However she got her first taste of New England-style weather when she visited Georgia when she was younger. Ribbins said that she had never really experienced cold weather, and this tournament was an eye-opening experience. It was raining. It was 27 degrees out. She was hitting into 30 mile per hour winds. She did have seven layers on, but it did not help her. In fact, she said that that day is the worst memory she has ever had on a golf course. She could not even swing the club due to the excessive amount of clothing, but that was not the worst part. The worst part was when she left her chapstick on the first hole. “They [my lips] were bleeding, it was raining … I was just a mess,” Ribbins said, laughing. Despite the horrors that she suffered during her first experience in a New England-style climate, she looks back on that day with a positive outlook, because that is the kind of person she is. Ribbins gives credit to her mother for the can-do attitude that she developed in her childhood. She said she would never forget the moments on the golf course with her mother, and after a cold, winter practice in March; she shared one of those moments. She believes that having that kind of perspective while playing golf is a luxury to have, and she said that’s one of the many things her mother taught her about the game of golf. That train of thought comes from a good place. And it is that line of thinking that helped lead Ribbins to a decision on where to play collegiate golf. She looked at some schools in North Carolina, but even though the weather was nice and it fit her in terms of her background, something was off. It did not feel right to her. But then she visited Quinnipiac University a couple of months later, and was overwhelmed by a new, lighter feeling. Ribbins has an easygoing attitude and a fun personality, and it helped her to fit in with the team from the moment she met them, especially junior captain Jenn Whaley. Whaley was the one to introduce Ribbins to the team’s culture. They call themselves the most fun team on campus, and Ribbins jumped in on that action from the get-go. Ribbins described the team’s love for food, games and dancing as “scary.” She also said that even though they like to have fun, when it comes down to it, they are a hard-working bunch. But Ribbins is used to hard work. 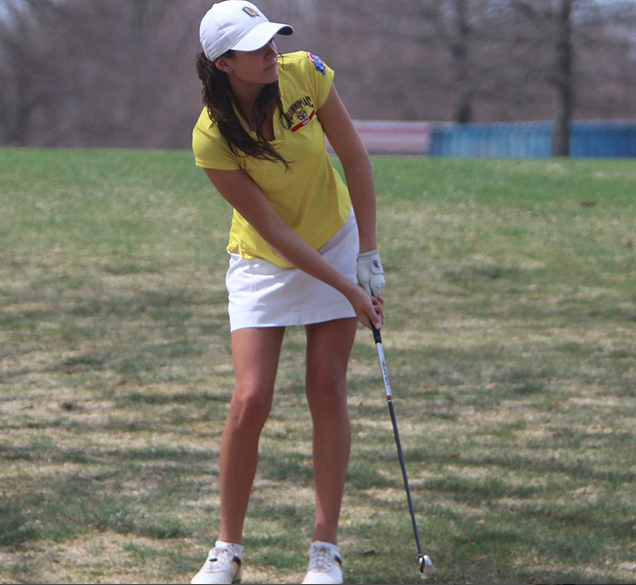 Last year she went to Puerto Rico for the Caribbean Amateur Championship. She competed at IMG Academy in Florida in 2012-2013. She was a member of the Cayman Islands Junior National Team from ages 14-17, and she was the youngest member of the Cayman Islands National Team at just 16 years old. But her proudest moment was not with her Quinnipiac team, and it was not with her Cayman Islands National teams. It was with the 2010 Connacht (Ireland) girls’ team. Ribbins lived in Ireland for two years when she was nine years old. She goes back every summer, and in 2010 they approached her to see if she wanted to play on their team. Her mom used to represent Connacht when she was younger, so Ribbins took the opportunity and ran with it. Ribbins takes her happy and outgoing spirit everywhere she goes, whether that is the Cayman Islands, somewhere in the United States, or Ireland. But she prefers to play in one place over everywhere else.